We Provide Roofing Services Throughout Louisiana! Are you looking for a better roofer in Louisiana? If so, ECO Commercial Roofing is here to help. We have more than 20 years of experience in the industry, and we are dedicated to great customer service, and top quality craftsmanship. Our CEO got his start in the roofing industry back in 1998, and he holds this company to high standards of roofing excellence. We can provide you with a variety of roofing services for both your home and office, and we specialize in Conklin roofing products. If you’d like to learn more, or get started, give us a call today at (833) 200-0571! We look forward to hearing from you! It’s not uncommon for clients to be concerned when choosing a new roofer. However, at ECO Commercial Roofing, we do everything we can to put your worries to rest. Our inspection process is very thorough, and we are happy to walk you through every part of the process, from explaining what the root problems are, to how we can solve them. Our roofing services are available in both Texas and Louisiana, and below, you can see the Louisiana parishes we service. If you live in a smaller parish not listed here, but that falls within a similar area, don’t hesitate to give us a call and ask if we can provide service in your area too! Unlike other roofing companies, we never cut corners to for the sake of a profit. We do our work thoroughly and properly to ensure the end result is exactly what you need for your home or business. 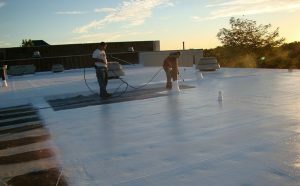 Our dedication to craftsmanship, in addition to the high quality Conklin roofing products we use, is why when you choose ECO Commercial Roofing, you’ll enjoy a better roofing experience. Whether you need a new roof entirely, or simply repairs or a restoration, our team can help. Click here, to see a list of our other services, or call our roofing office today at (833) 200-0571 to speak with qualified roofer about your roofing needs. We look forward to the opportunity to work with you! Updated on November 30, 2017 at 3:20 pm by ECO Roofing.